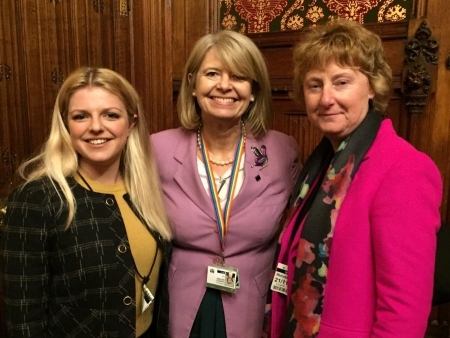 West Worcestershire MP Harriett Baldwin welcomed two constituents to visit Westminster as part of celebrations to mark the centenary celebrations for women being allowed to become Members of Parliament. And the MP met with the two West Worcestershire women in the Houses of Parliament to talk to them about following a career in politics. Hannah Campbell, from Malvern, is already a town and district councillor and Jane Kemp, from Bayton, is a lawyer working in Birmingham. Both attended sessions held across the Parliamentary estate talking about the best ways to get involved in politics, either at a local or national level. Hundreds of women from across the country, gathered in Westminster as part of the celebrations which marked the 100th year since women were first allowed to stand for Parliament. Harriett commented: “There are still too few women in Parliament and I try my best to encourage women to come forward and stand for public office, either locally or nationally. Hannah added: “I was grateful to Harriett for nominating me to take part in this event and chat to other like-minded women. There are still far too few women involved in politics at all levels, and even fewer people of my age, so I hope that this is the starting point for me to get more closely involved in Westminster politics. Photo: At the Houses of Parliament (l-r) Councillor Hannah Campbell, Harriett Baldwin MP and Jane Kemp.